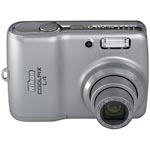 8-megapixel: The Nikon Coolpix L20 delivers stunning photos in sizes up to 11" x 17". This camera's exclusive image processing technology enables optimal exposures in even the most challenging lighting environments by evaluating 256 areas in each frame. Zoom: The Nikkor 36-126mm glass lens (35mm equivalent) with 3x optical zoom captures incredibly sharp, clear images. The added 4x digital zoom lets you enlarge details before or after shooting. 2" LCD: The bright 2" LCD makes composing pictures easier, as well as making it more fun to share pictures while they're still in the camera. Nikon's exclusive feature system: Use the In-Camera Red-Eye Fix to remove red-eye, or repair dark images in-camera with the D-Lighting feature. Scene modes: Fifteen scene modes (portrait, panorama assist, landscape, etc. ), four with Scene Assist, guide you in taking better pictures automatically. A great new function in the portrait mode is Face Priority AF, which automatically finds the subject's face and focuses on it. Macro mode: Enjoy incredibly-precise focusing in macro mode—you can shoot at very close distances (to 1.6") from your subject. Memory: This digital camera comes with 16MB of internal memory so you can start taking pictures right away. Get the most out of your camera by adding a 512MB or larger SD memory. How much memory do you need? Click here to find out. Movie mode: Record QuickTime movies at 15 frames per second. The length is only limited by the available space on the internal memory or your SD memory card. PictBridge-compatible: Print pictures directly from your camera by connecting the Coolpix L4 to any PictBridge-compatible printer. Battery life: Shoot up to 250 pictures on a single set of AA alkaline batteries (included). Safest and 100% Secure Shopping Guaranteed! Happy Holiday Gifts Shopping to You!We don’t see or collect Your Info! No accounts to register and sign in! Submited form info is forwarded straight to Your Bank! We receive as feedback from Bank only Your Name, Product Name, Quantity,Amount of Money paid!